This is a handbook about using Outdoor Adventure Education (OAE) in youth work, including introduction to concept of Outdoor Adventure Education, facilitation and reflection processes, and examples of activities used in it. 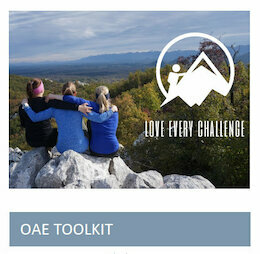 The goal of “OAE Tool Kit” is to introduce the readers to the concept of Outdoor Adventure Education, as well as main learning outcomes and activities used during Erasmus+ training "Love Every Challenge", that can later be used as a helping tool for youth workers in planning and implementation of future projects and activities related to Outdoor Adventure Education. “OAE Tool Kit” was created as a part of the learning outcomes of Erasmus+ training "Love Every Challenge" that was organised by Outward Bound Croatia and happened in October 2016 in Croatia, gathering 24 youth workers from Portugal, Latvia, Netherlands, Spain, Finland, Poland, Romania and Croatia. Handbook consists of introduction to the historical development of Outdoor Adventure Education (OAE), main elements and success factors, OAE impact on participants, tips and insights about facilitation, management styles and communication, reflection processes, discussion wrap-up about OAE reality in Europe and activity descriptions (team building, GTKEO, energizers, expedition) used during the training. Erasmus+ training "Love Every Challenge"